It was very pleasant indeed to welcome the Manchester Players to Liverpool on November 16th when, in conjunction with the Argosy Players two one-act plays were presented in the little theatre at Head Office. The occasion was the first of its kind, and received recognition in the presence of Mr. and Mrs. Verity, Mrs. Conacher, Mr. and Mrs. Tarn, Mr. Banks, Mr. Price, Mr. and Mrs. Carter, Mr. and Mrs. Whiteley, and a very strong representation of members of the management and staff of the Liverpool district. The theatre was packed. The choice of the Manchester Players fell on “Antic Alibi”, a drama by Jack Walsh. Comparisons on an occasion such as this are inevitable but it can fairly be said, without any attempt whatever to sit on the fence, that there wasn't much to choose between the two performances and both companies put on well-acted and enjoyable shows. The Manchester Players did not need any prompting, however! The Manchester actors had obviously been on the stage before and Glenys Jones's presentation of the lady of questionable character was extremely good and brought her well-merited applause. 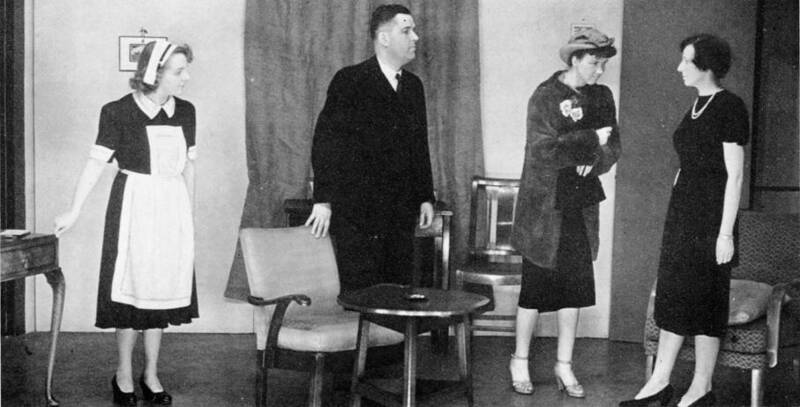 Joan Middleton as Lady Stamming and William Keil as her solicitor had that ever-present difficulty of working up a rapid state of suspense within the time limit of one act. They managed excellently until the departure of Glenys Jones. After that we thought that they experienced some difficulty in maintaining it, though from an acting point of view the scope is there. The difficult part where the solicitor strikes his client and the subsequent situation seemed to lack fire. Nevertheless, these two actors carried the play and held their audience, it was just that slight unevenness which struck us. The part of the maid was taken by Edna Holden, who had much more of a part than is usually allotted to a maid. She did it with dignity and poise, and that artificial subservience which is so often seen on the amateur stage in this role, was, happily, lacking. It was a very enjoyable little play and the Manchester Players can feel proud of it.